In this video below, Geoff Fahringer, who is an expert diver, demonstrates what to do by rolling an older vehicle down a ramp and into an 8 foot deep canal with him inside, and later in the video, with several people. For a dozen years, he's been on the dive rescue team for the Collier County Sheriff's department in Naples, Fla. According to researcher Gordon Giesbrecht, the bottom line is that there simply isn't enough time for rescuers to reach you in this situation, you have to do it for yourself. 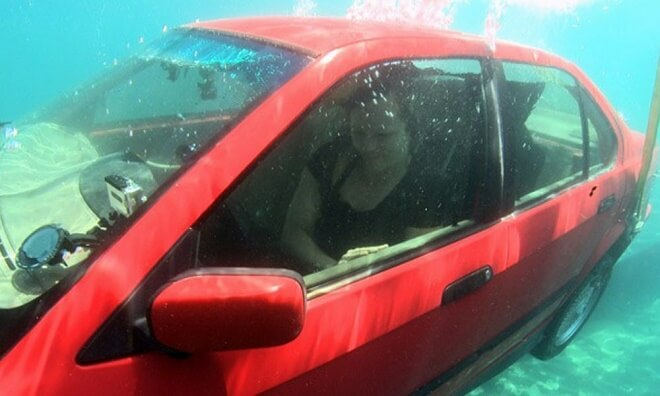 “We're telling people that you have to get out of the vehicle before the water gets up against the windows, and that's really in the first 30 to 60 seconds.”, he says. That means, don't reach for your cell phone when you hit the water. “Don't call 9-1-1 from inside a sinking vehicle,” he adds.